The Gore Spotlight review: Love Will Tear You Apart by Rose Garnett, for another example, follows a woman commanding a horde of violent “servants” who may not be what they appear. This mixture of character background and intent is great, as I feel it humanizes the characters and gives them depth. It portrays the women within the pages as complex, capable of both good and terrible actions depending on the individual. There are plenty of things to do with this leniency, and the book takes every advantage. 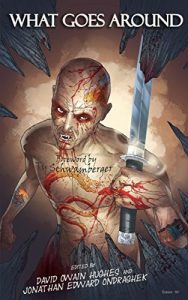 Amazon review: This horror compilation is unique for its differing versions of what constitutes the horrific, making each story a single read in a variety pack. From the outset, the reader is offered a foreword that explains the elusive and fluid nature of horror and how it may appear in the most peculiar places. Each story here respects that idea, making the whole a mixed bag of shorts that fall somewhere along the spectrum of the genre. I’ve always found the most interesting takes on horror are a combination of genres, and here “Something Old, Something New, Something Cursed, Something Blue” is a perfect example of how well magical realism complements horror. As with the Fantastic of the nineteenth century, the bizarre may be as horrific as horror-filled. I challenge you to find at least one story here that doesn’t leave you with an eerie feeling. The anthology reached number 21 in the UK Amazon best sellers list.